ATM users worldwide made 99 billion cash withdrawals in 2015, according to Global ATM Market and Forecasts to 2021, a report by research and consulting firm RBR. The firm’s annual ATM research shows the number of withdrawals rose in all regions, most notably Asia-Pacific and the Middle East and Africa, where volumes were up 16 percent and 8 percent, respectively. 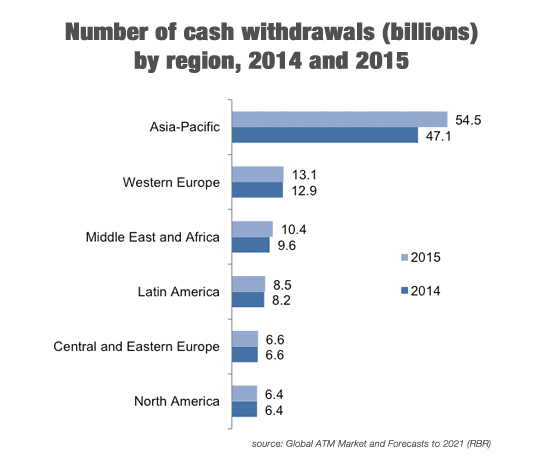 In China, ATM withdrawals increased 23 percent year over year. The nation’s 24 billion withdrawals comprised nearly one-quarter of the global total. Growth in China was driven by that nation’s move toward financial inclusion and by banks’ efforts to move transactions to the self-service channel, RBR said. Researchers found similar factors contributing to growth in the developing markets of Asia-Pacific and MEA. Egypt, India, Indonesia, Malaysia, Pakistan and Saudi Arabia ranked among the nations that experience particularly strong growth. Though the research shows ATM use is stable or falling in some mature markets, most continue to see an increase, RBR said. For example, in the U.S., where an increase in surcharges had contributed to a decline in withdrawal volumes over several years, transaction levels actually rose. In Spain, withdrawals grew 8 percent as that country’s economy gained strength.